I'm using 1.04. When I said I made it work in 1.0-rc2, I was using 1.23. Ok, thanks. I will fix this in the next release. U8glib v1.05 is now available. where pins are shared with other devices. 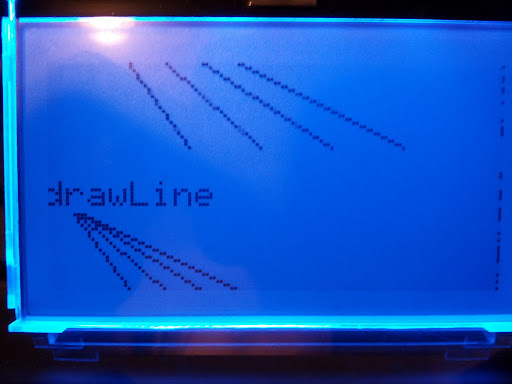 U8glib has also been tested with Arduino 1.0.1 IDE. these display types would be great. I had to release v1.06 because of the broken u8g.h file. This will fix the problem with U8G_PROGMEM. Additional there is now support for SSD1306 (thanks to Yann) and SBN1661 (thanks to Alex). I'm using the library for the DFRobot ST7920 128 X 64 LCD and it works without a problem, both in serial as in parallel mode. But the weird thing is, is that the parallel mode is a bit slower. In SW serial I got a refresh rate of 6 to 7 frames per sec and in 8bit it goes down to 4 to 5. Is this normal behavior or am I doing something wrong? Thanks for the hint. I will investigate this. I'm trying to get NHD-C12864A1Z-FSB-FBW-HTT working with the u8glib, but I'm getting nothing the screen. It works fine with the Adafruit library. I've checked the pin mapping several times and I have connected to the Arduino correctly. I've unsuccessfully tried loading it as the following ST7565 devices: U8GLIB_DOGM128, U8GLIB_LM6059, U8GLIB_LM6063, and U8GLIB_DOGM132. Is there something I'm missing? 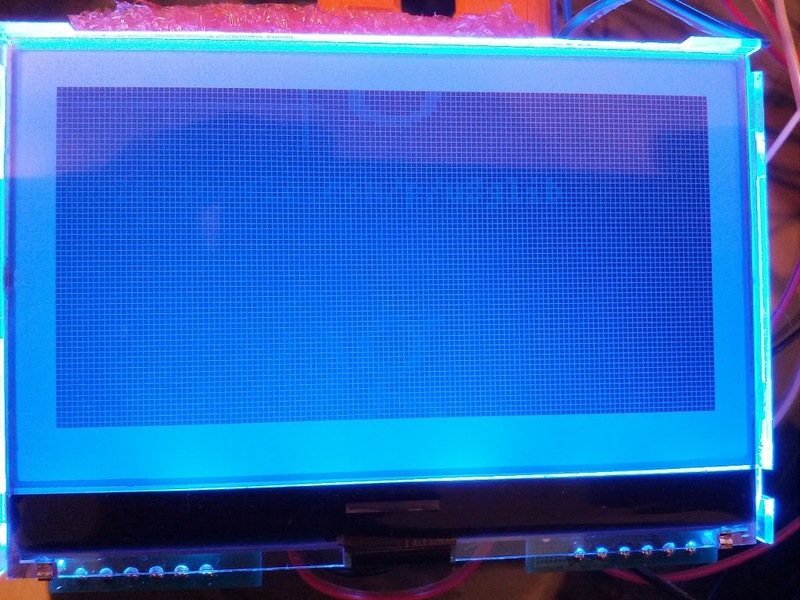 So, the NHD display works with Adafruit Lib https://github.com/adafruit/ST7565-LCD/tree/master/ST7565 but not with U8glib, correct? 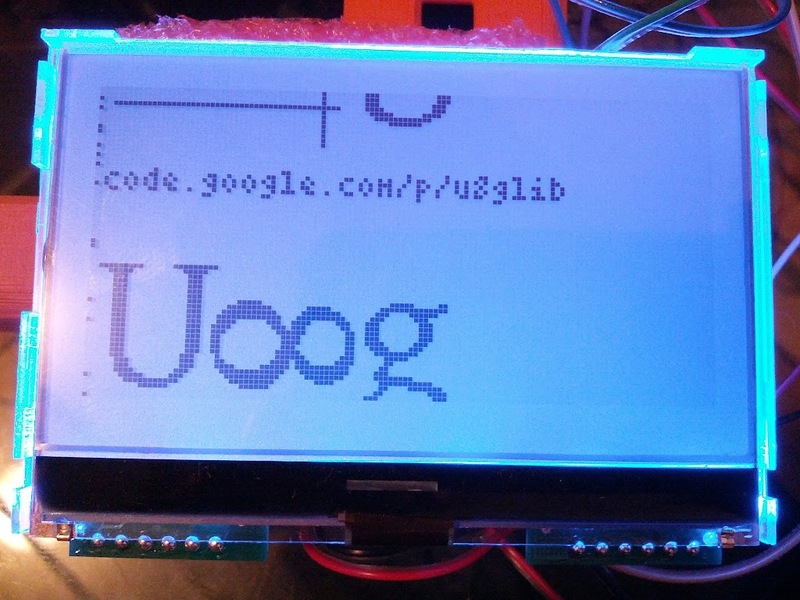 Below is the code used in the Adafruit and u8glib sketches. The Arduino is connected the same in both cases. The Adafruit one works, but the other does not. and connect the reset signal to 3.3V. I poked around and I haven't found where I would define the page mapping. Great. Now we need to correct the display and the Bias. 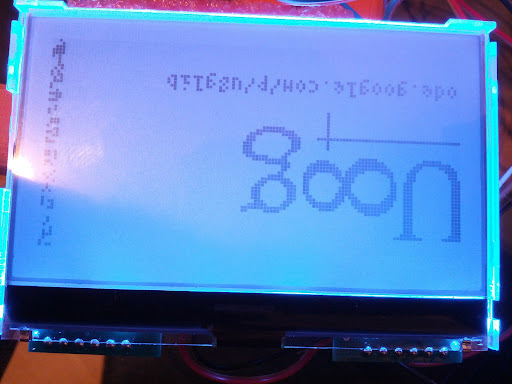 I have seen that the Adafruit code and the NHD display do differ in that. I also guess that I need to implement another variant for this display. So, here is another request from me. Can you apply the U8GLIB_DOGM128 constructor? Maybe you can also send a picture of the result with the DOGM128 constructor. Main questions are: Is the contrast as good as before? Is it better? 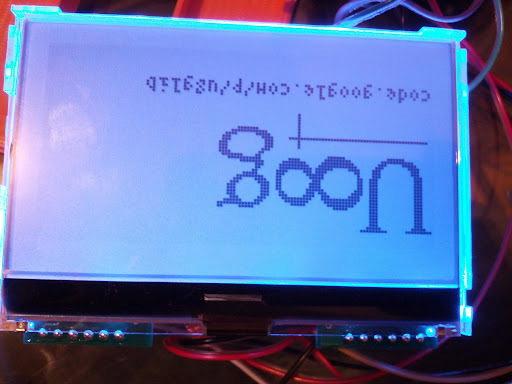 I also expect that the wrong line will disapear but the display might be flipped (not a problem, because u8glib can rotate the screen by 180 degree) and probably the row mapping is still wrong. If the row mapping is still wrong, i would like to use the DOGM128 as a template for further changes. I'm making an Arduino shield for this LCD, so I'd be thrilled to see these changes make it upstream. It would be nice to point folks to u8glib. I really appreciate the work you're doing to unify the graphics libraries. I'll match the pin mapping with the u8glib default pins. A contrast of 0x005 in the DOGM128 constructor seems a little more washed out than the LM6059 constructor. I've cloned your google code repo and I'm able to run ...arduino/create_release.sh. Do you want to make the changes in there and I'll test it? I can also rewire my setup to be consistent with your library. Thank a lot for the pictures. I have created a new device in the repo: NHD_C12864. So you need to update the repo. At the moment, this is an exact copy of the DOGM128 code. --> change line 79 to "0x004"
Once you find the best values, i would be really glad to add these values to the new device. Also, let me know if there is something else wrong with the new NHD_C12864 device. Changing line 79 to 0x004 worked. The pixels are aligned. Changing line 61 (not 68) to 0x008 looked good for contrast. I played with several values. 0x009 also worked. 0x010 is where the background started getting funky. Keep line 55 at 0x0a2. 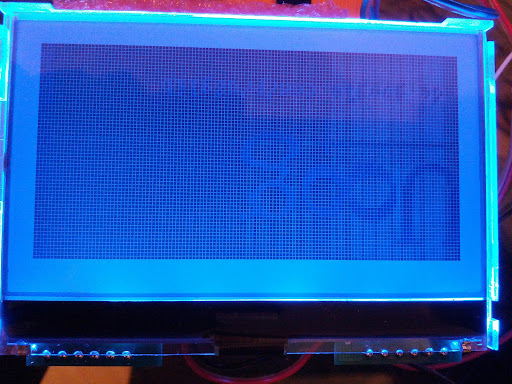 To get a reasonable screen using 0x0a3 I had to bring the contrast down to 0x003. Some people might consider the display to be upside down, but this is the orientation in which I would like to use it. It allows buttons beneath the screen to be as close as possible. Are you cool with leaving it like this in the library? It would mean one fewer steps in my instructions.